Business Intelligence Software is also popular as BI Software; it’s really booming industry in the market and this is a really suitable thing to understand the dentition of smart work. It’s not about to do hard work to improve your business, it’s all about to do smart work for business development. BI software is one type of business analytics software where you can easily analyze past and present business data to get actionable insight. This software will help you to make smart decisions for your business. The best business intelligence software collects all-time business data, organizes and visualizes important KPI. BI software will help you to create the best report of business performance so you can also consider it as a business reporting software. It’s time to say no to guesswork; you can effortlessly manage your inventory and increase sales through BI Software. It’s the best software for the competitive edge. 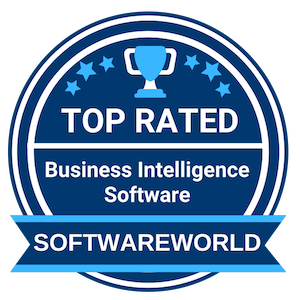 SoftwareWorld provides you the leading names of business intelligence software companies who offer the top BI software in the market. Let’s take a look. What are the Best Business Intelligence (BI) Software in 2019? » Our score is based on user satisfaction (reviews & ratings), social media buzz, online presence, and other relevant information. About Sisense : Get the instant Analytics for your data with Sisense; this is business intelligence software offers complete business analytics platform where the user can easily clean and combine all data from different sources, explore & analyze data instantly with interactive visual analytics, and find dashboard & reporting feature to get the perfect insight of business. Sisense is easy to use software to get instant business insight from complex data. About Zoho Analytics : Zoho Analytics is a data visualization software that works for all sizes of organizations to have visual insights with the collected information. It lets users create and share powerful reports within minutes and helps in uploading and synchronizing data from spreadsheets or other web applications. Features like drag & drop interface, report sharing, dashboards with indicators and BI make this solution a top-rated solution for companies requiring visual reports. About Looker : Looker connects the users with useful data in a scalable and flexible way; the leading business intelligence dashboard software defines business metrics, make data more beautiful & meaningful and build trustworthy data culture. The user can connect Looker to any relational database, the software automatically generates a data model from the schema, refine the model to reflect a company’s unique metrics, and build KPI dashboards and departmental reports for organizations. About Adaptive Insights : Make your business planning easy and plan with Adaptive Insight; it’s cloud-based business budgeting software where the user can get financial planning feature. It’s the best business intelligence software where the team can collaboratively plan across the enterprise and make smart decisions faster. You can use this budget planning software for finance, sales, and workforce. It’s the perfect solution for the small, mid-sized and big enterprises. About WebFOCUS : WebFOCUS is Information Builders’ Business Intelligence (BI) and Analytics Platform, offering three editions for enabling self-service features for all user levels. Business User Edition, Application Edition and indeed Enterprise Edition, encompass various tools such as InfoAssist+, InfoApps and App Studio to not just generate insights from data but also publish customized analytical applications. This flexibility, scalability and usability is backed by a graphical, integrated development environment and dashboard-based approach to creating a wide variety of BI information content. About ClicData : Managing data can be ugly but you can make it beautiful and useful through ClicData; business intelligence tool to get insight into the business. The user can access any of reports with a single click of a button and exactly know about the running task status. The user can share and distribute their dashboards through automated emails to anyone with attached reports, allow anyone to access live reporting using live links, and create images, PDFs, or Powerpoint slides. “Clicdata is our preferred choice for Dashboards. The ability to merge many data sources. We use Google Analytics, Google AdWords, Facebook, Instagram, YouTube and custom SQL databases. The ability to see my datasets in one location.” – Michael F.
About BOARD : Analyze, simulate and plan with the best decision-making platform; BOARD is business intelligence (BI) software and data analytics tools for sales, marketing, supply chain, HR, and finance departments. The business team or the user can reach a single vision of their performance in a simple and effective manner. The user can also explore data, run an effective analysis, build interact dashboard, and create meaningful reports with BOARD. “Combine business intelligence, corporate performance management, and business analytics. The best part of this software is It connects to virtually any data source and easily will produce dashboards enabling great analysis. The implementation and ease has been great” – Shivakant D.
About Dundas BI : Get extreme flexibility, massive capabilities and endless possibilities for your business with Dundas BI; it is business intelligence software to control over data; the user can create the dashboard, embedded analytics, and personal user experience with the software. The user can also find dashboard & reporting feature, self-service analytics & visual data discovery, and white label BI through Dundas BI. You can improve data visualization with this software. About Hubble : Bring your data to life for robust decision-making with Hubble; it’s an integrated suite of performance management apps where the user can get reporting, analytics, and planning features in a single & real-time solution. By using Hubble, the organizations can simplify the reporting process and it really empowers the organization’s decision-maker. The non-technical user doesn’t need to technical person to use this software. It’s easy to use business intelligence software. “We’ve been using Hubble for 10+ years and loving it. It’s a very powerful reporting and analytic’s tool that saves us time and effort at moth’s end, during the month and at audit time. Hubble is very user friendly, can start using it the minute it’s implemented. The data is accurate and available very quickly.” – Zina G.
About TapClicks : Grow your business, increase client retention, and save time & effort with TapClicks; it’s a leading marketing reporting dashboard and operation platform to get faster marketing insights. The user can spend less time to gather data and easily reduce churn through TapClicks; it offers the best platform to build revenue and communication ROI to the users. The software delivers the best way where the user can quickly get insight and information. About Alteryx : Discover the best analytics platform with Alteryx; the software offers modern data analytics where the user can easily unlock the answers hidden in data and easily drive business outcomes faster. Through using Alteryx, the user can easily avoid inflexible and slow analytics implementation to the business. The user can solve the most complex analytic in less time with the help of this software. It’s really the best business intelligence software for all-sized businesses. “Ease of implementation, fantastic product support. Great assistance from Altyrex – committed resources at no cost to help implement, train etc. A lot of willingness to help us ‘prove’ the business case – i.e. make a success of the pilot project.Massive time saving on Analytical function as well as improvement in accuracy.” – Daniel D.
About Cluvio : Listen to your data with Cluvio; the best cloud analytics platform for startups and data-driven teams. The user can discover the wealthiest information from complex data with Cluvio. The user can also access real-time dashboards anywhere, anytime with the software. The software also offers notification feature and makes everyone curious about discovered data. The user can also find SQL-based analytics, interactive dashboard with pleasure look, SQL editor, intelligent recommendations, and much more through Cluvio. About Intellicus : Intellicus is the global provider of next generation web-based business intelligence and reporting solution. Since 2004, they’ve successfully deployed 10,000+ commercial installations across the globe. At Intellicus, we have a passion to deliver a world class BI experience to all our end users. Our customizable and modular solution has made us the product of choice for large & small scale enterprises. Our flexible architecture and robust integration framework has won major OEM relationships with leading ISVs. We are continuously adding value through enhancements and additions to the product with each of our new releases. More than 40,000 individuals and SMEs also are utilizing the power of Intellicus Free Edition, across the world. “Intellicus is a amazing product with easy to use interface and appealing visualizations. Its fits for all the mentioned requirements – Adhoc Reports, Standard Reports, Interactive Dashboards, Visualizations, ETL and many more. It comes in different editions tailored for various set of users. It’s trial version is available free of charge on their website. It is definitely worth a try !” – Anirudh K.
About Corporater BMP : Founded in 2000, Corporater is a global software company that empowers medium and large organizations to evaluate, manage, and continually improve business performance by providing a business management platform that adapts to client’s unique business model, out of the box. The business management platform delivers enterprise performance management, budgeting, planning, dashboards, scorecards, KPIs, financial consolidations, reporting, portfolio management, governance, risk, compliance, and more. 15. Analytics Plus – Advanced analytics for deeper insight into your IT. About ManageEngine Analytics Plus : Integration with ServiceDesk Plus helps Analytics Plus improve IT service delivery performance and efficiency with better insight into your ITSM data. Choose from over 100 reports and dashboards built on more than 80 KPIs or customize them to create your own, without being a data expert. Get deeper insights on network monitoring, application monitoring and customer support operations, by integrating with ManageEngine’s IT Operations and Support suite. Almost every time, big business decisions are taken on the basis of pre-analysis of available data. Organizations having strong data mining team come up with robust business decisions. With that being said, the need for a data mining team can be considered a priority. However, not every time, human works can be error free. Also, it takes a considerable amount of time for a dedicated team to hunt down potential resources to collect data. In this case, business intelligence software can be your savior. » What is Business intelligence software? » What does Business Intelligence software do? » Why do you need a Business Intelligence (BI) Solution? » How to choose the best Business Intelligence software? » What are the features of Business intelligence software? » How much does business intelligence software cost? » What are the top business intelligence software in 2019? The Business Intelligence software or the BI software is a suite of applications integrated to enhance the productivity of any business. It helps in transforming data into actionable intelligence to help managers come up with easy and quick business decisions. Also known as descriptive analysis, bi software differs from BA software (Business Analysis). Unlike BA, BI does not tell you what to do; it says what it was and what it is. Business Intelligence tools access data in a detailed manner and summarize the facts on the dashboard in the form of graphs, charts, and maps. It can provide valuable insights into your business to increase sales intelligence to a new level. BI offers a series of tools to analyze the data in order to understand the current market trends better. It streamlines the effort people need to put into data mining in order to obtain the information required to come up with an easy decision to a complex problem. As it can analyze numerous data points under a single time frame, taking decisions becomes quick. » Why do you need a Business Intelligence (BI) Solution? Is it worth investing money in? Without a doubt, the answer to this question will be a big Yes. The business intelligence software helps tailor day-to-day work requirements without the need for technical experts which also helps in cutting down the financial expenses and wastage of resources. Hence, within a shortened amount of time and with greater efficiencies, companies can get daily essential reports on self-analytics for the efficient organization of their work environment. It’s like having a genie which helps by providing solutions which cater to every need of an organization. Moreover, the real-time instant updates also help businesses and companies to develop audience-specific products and content which aids in maintaining the traffic inflow to the organization. With the ever-increasing rise in the competition between businesses, the race for emerging as the most recognized and sought after the business group has become a very daunting affair for companies and industries. So, one should always know some tips and tricks so as to be able to invest in a good business intelligence software. Businesses are more and more implementing business intelligence software with instant support features to reduce the time taken for resolving user issues. This creates an additional layer of trust on the company, thereby attracting the inflow of traffic while minimizing the use of resources. Data withdrawal and the facility to access data from anywhere provides a streamlined process of data retrieval and authentication. Moreover, the real add-on is when a user is able to access both contextual data, relational sources, and metadata of each field involved. While choosing a business intelligence software, one must ensure that proper care is being given to research that the bi software allows different interactive methods for separate communities, such as one for the casual public and the other one for the administrative users. This allows maintaining uniformity over the working of the business. The facility of external sharing, when provided in a business intelligence software, is definitely a charm as it improves public engagement by enabling the approved members to comment, suggest edits, and many more, which results in bringing up a more refined and innovative business idea. Every company has its own share of confidential information which needs to be kept safe no matter what. Hence, while choosing a BI software one must be careful enough to choose a legitimate one so as to save their company’s secrets from leaking out. A good business intelligence software not only gives better protection to the confidential information but also ensures regular tracking of data usage to unveil any potential threat. Various BI software comes with user-friendly user interfaces which also plays a bigger role in the retention of the traffic. Moreover, the user interface should also be capable of meeting the user requirements, while simultaneously in compliance with the corporate environment. Also, companies and businesses providing mobile interfaces should also ensure a good responsive touch and instant page opening in their native apps. With a myriad of additional features available in business intelligence software, we have mentioned the most productive features which are essential for a business. OLAP or Online Analytical Processing helps in extraction and query various data and form meaningful information out of it. With valuable information, you will have the opportunity to look them from all possible angles. OLAP assists a company with financial reporting, budgeting, planning, sales forecasting, trend analysis, etc. All data collected from multiple sources are stored in data warehouses and classified into data cubes. Establishing a robust data warehouse, you can segregate and categorize your data according to different dimensions. All the organized data are stored in OLAP cubes and used for interpretation and decision-making process whenever required. An executive dashboard provides a graphical representation of your business’s overview. With vivid graphs, charts, credible reports and summaries on your disposal, you will have the opportunity to take viable and faster decisions in the future. This feature offers a one-look view of your company’s worst and best-performing activities. Whether it’s related to a product or a marketing campaign, you will get the performance ranking in one single page. It will let you access performance ranking based on different criteria and enables you to take corrective measure on negatively performing facets. With Ad-Hoc Report feature, you can ask your non-technical team to generate their reports without massively depending on the IT department. The feature allows the end users to pick up respective elements and add data in it. For example: if you have an outside sales force who are supposed to submit their daily reports regarding sales, orders taken, client visits, etc, then they can send you daily reports through the Ad-Hoc Reporting feature. You can collect all the data from your sales team from different territories and make a meaningful assumption without any dependency on the IT team. It’s not logical to provide full access over classified data to everyone. Therefore, a User Specific Security feature allows you to restrict specific users regarding their power on accessing data. With this feature, you can personalize particular data sets and enable their access to only a specific individual or group. This feature allows you to categorize your massive amount of data into a wide range of interpretations using functions like regression and statistical analysis. With a what-if feature, you can run a future analysis on your upcoming business decisions. If you are unsure if your next choice is going to be fruitful or not, then you can use the what-if analysis using past data and predict the future impacts of your proposed business plans. The Predictive analytics feature of a Business Intelligence software helps in forecasting the future behavior pattern by taking raw data (new and historical data) into consideration. It offers promising predictions regarding the change in activity, behavior, and trends. The software adopts advanced algorithms and methodologies like Decision trees, logistic regression models, and time series analytics. The emergence of big data system helped enterprises in accumulated Goliath data mining and helps the company with predictive insights. The features of predictive analysis are used by vital sectors such as Financial Services, Insurance Companies, Healthcare, manufacturing, and retail, etc. The Predictive Analysis is a crucial feature which must include in your business intelligence dashboard software. The feature helps you with targeting online advertisements, detects any futuristic failure based on past & current mistakes, determine the purchasing patterns of customer and analyze theirs over behavior and more. With this feature in your business intelligence solutions software, you can set long and short term goals for your business. The software helps you determine the required resources for your purpose and assist you with the implementation and achievement of that goal. The app facilitates a productive business environment where you can take responsible business decisions. This feature provides information based on which you can make futuristic changes in your cost prices, revenues, and sales. Before investing in a Business Intelligence software with this feature, make sure it comes with the forecasting feature your business requires. Features include investment tracking, production forecasting, sales forecasting, financial forecasting, Human resources forecasting, etc. you can select software which consists of your required type of forecasting integration. However, it’s always better to choose software that includes all variety of forecasts in a single combination. This feature helps with your business’s overall performance by determining the possible improvements you must implement in your business. You can set likely targets and collects meaningful insights on various industrial trends. The Benchmarking process let you compare your different business process and performance metrics as per predefined Industrial Standards. This helps you gain insights into your underperformed and over-performed areas of business by putting your business performance in perspective. The feature enables you to prepare for a better business opportunity by identifying the improvements which you must consider. The business decisions are backed with logical data rather than a personal perspective. All you have to do is define a process, identify your potential partners, followed by a few other simple steps. Then the software will display the existing gap in your business along with displaying the differences in processes involved in your potential partners. You can establish your future difference, target future performance, modify your goals and implement them with ease. With this feature in your BI Software, you can forecast the profitability of a business proposal or enhance the profitability of an ongoing project. The software helps you in identifying various pros and cons of your products and services by analyzing raw data. It takes the market trends in perspective and displays the potentiality by anticipating the sales and profit you can incur through it. With this integration in your Business Intelligence system, you can identify your profitable clients and get an idea on whom you need some more work. If you are accumulating business information from different sources, then this feature can help you decide the credibility of each source. It helps you identify the reasons behind sales decline and offer promising remedies. Also, it takes the customer demand in perspective and offers you various ideas about how to enhance your relationship with customers. The pricing part varies depending upon the scalability and bi tools integrated into the software. Usually, four types of pricing structure are available – Quote based pricing, Business size-based pricing, Product set based pricing and App offering based pricing. However, taking an average of values from low to high, the average monthly price of business intelligence software can be capped at $220/ month or roughly $3000 per year. Business Intelligence software is a boon for business people to come up with robust decision-making power. It helps to visualize data on a broad perspective and chunks out the necessary information required from the pool leaving the rest behind. Though there are many alternatives available in the market, it is better to go through tight scrutiny before subscribing to any particular software. » Business Dashboard Software - Business dashboard software is generating a huge amount of buzz in the market. This software is nothing but a unique tool of data visualization, which is capable of consolidating as well as displaying the metrics status and the KPIs (key performance indicators) for a particular organization, a specific process, or a department. » Data Analysis Software - The best data analysis software will prevail your data to go through the processes of cleaning, being properly inspected, going through a transformation, and coming up with conclusions of the goals you set by you. It helps you in decision making by making everything crystal clear and crisp. » Business Performance Management Software - A Business Performance Management Software was earlier used only in the finance departments, but times have changed, and this software is being used by a number of businesses in order to increase the business intelligence. » Data Visualization Software - Data visualization tools enable you to analyze data in a simpler format. It helps in making complex and unmanageable data easier to handle with the help of dots, lines, bars, or charts. Within the realms of visualizing data, tables are used mostly to be able to look into specific measurements.